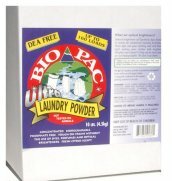 A concentrated laundry powder that gets your clothes clean and your whites white. Good for areas that have hard water. Ingredients: Zeolite, linear alcohol ethoxylate, linear alkyl sulfonate, sodium carbonate, carboxymethycellulose, sodium chloride, citrus oil. Directions: Use 1 oz. (1/8 cup) for front loader, 2 oz. (1/4 cup) for top loading machines. Use more for heavily soiled loads or large capactiy washers. Always test for colorfastness by rubbing a small amount directly on a hidden part of the fabric. Rinse thoroughly and check. This product is also safe for HE (High Efficiency) washers. Just use half as much. Use with hot or cold water.